In the spirit of ALL THINGS PSYCHOLOGICAL IN MANHATTAN, we are pleased to announce the following Fall 2015 events. Getting involved” at the United Nations: Why and how? In the 70 years since the United Nations was formed in 1945, it has encouraged “civil society” groups and individuals to “get involved” in its important work. But how? Here, three experienced panelists describe this process. Bob was Professor Emeritus at John Jay College of Criminal Justice, of New York City and Prospect Point, Maine. He passed peacefully on April 9 at age 83. He gained recognition asserting that “Sybil,” whose tale brought multiple-personality disorder to public attention, actually had a single troubled personality. His many books included “Manufacturing Social Distress: Psychopathy in Everyday Life” and “The Psychopathology of Language and Cognition.” He edited the Encyclopedia of the History of Psychological Theories, and The Collected Works of L.S. Vygotsky. A film noir connoisseur, he co-wrote “Film, Television, and the Psychology of the Social Dream.” A Penn State grad, with doctorate from University of London, he was on faculty of Columbia, visiting professor at Fordham University, and fellow of the American Association for the Advancement of Science, American Psychological Association, and New York Academy of Sciences. He was editor of the Journal of Social Distress and the Journal of Psycholinguistics. A lover of rare literary treasures, his distinguished collection is now cataloged. What is psychobiography? What is its future in a globalized world? Robert A. LeVine, a psychological anthropologist at Harvard, was in Social Relations at founding of Culture & Personality studies with Whitings, Kluckhohn and Murray. Sudhir Kakar, first Indian student of Erikson, is a leading psychoanalyst on the subcontinent. Paul Elovitz is founding Director of the Psychohistory Forum. Joseph G. Ponterotto, a psychobiographer and professor of psychology, whose latest book is A Psychobiography of Bobby Fischer (2012). Author, psychologist and consultant Dinesh Sharma’s seven books include Barack Obama in Hawaii and Indonesia (2011) and The Global Obama (2014). All are welcome. Beverages are served. 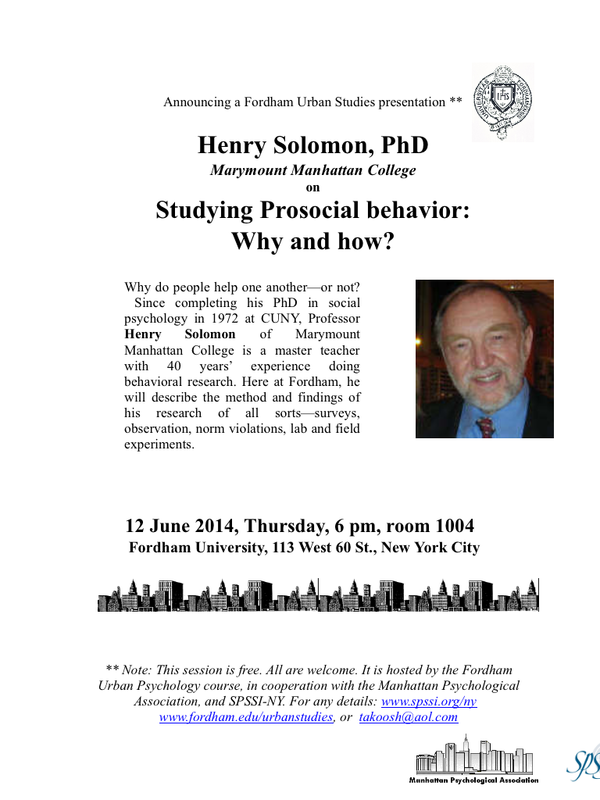 ** This forum is hosted by Fordham University, in cooperation with the Manhattan Psychological Association, and APA Divisions of International Psychology and Social Issues (SPSSI-NY). similarities and differences by which members of the field are addressing today’s important questions. While all topics will be considered, special emphasis will be placed on those which reflect the conference theme: promoting peace for children and adults. mentor (if any). We anticipate mostly symposia and welcome full workshops or symposia centered on a theme. If you are submitting a single paper, we will group you in symposia appropriately. For additional details contact Conference Chairs, Dr. Marisa T. Cohen, Dr. Sunghun Kim, or Dr. Karen Wilson at NYBehavioralConference2015@gmail.com. **To be considered for an award, you should submit your full paper, in addition to the abstract by the October 9th deadline. We are so excited to have Dr. Michael Wessells, who will be presenting his work, Getting beyond the humanitarian silos: An integrated approach for supporting the resilience of war-affected children. Michael Wessells, PhD, is Professor at Columbia University in the Program on Forced Migration and Health. A long time psychosocial and child protection practitioner, he is former Co-Chair of the IASC Task Force on Mental Health and Psychosocial Support in Emergency Settings. He has conducted extensive research on the holistic impacts of war and political violence on children, and he is author of Child soldiers: From violence to protection (Harvard University Press, 2006). Currently, he is lead researcher on interagency, multi-country research on community driven interventions for strengthening linkages of community-based child protection mechanisms with government led aspects of national child protection systems. He regularly advises UN agencies, governments, and donors on issues of child protection and psychosocial support, including in communities and schools. Throughout Africa and Asia he helps to develop community-based, culturally grounded programs that assist people affected by armed conflict and natural disasters. How can students best prepare for competitive graduate schools and careers while still in college? Hear experts briefly present answers to different aspects of this important question. A series of 5-minute messages is followed by individual consultation with the speakers. All are welcome. Refreshments are served. Overview Harold Takooshian, President, Manhattan Psy Assoc. All are welcome. Beverages served. (1) An illustrated tour of the remarkable sweep of NYC psychology–people, places, and events–with MPA President Harold Takooshian. (2) Comments by a panel of distinguished discussants below. (3) At 6:30-8 pm, a reception and joyous centenary salute to the City’s preeminent psychologist, Jerome S. Bruner. ** Note: This forum is hosted by Fordham University, in cooperation with the Manhattan Psychological Association, SPSSI-NY, NYSPA-OCW, Fordham Psi Chi. Is happiness just a positive emotion or a specific way of life? Does it work as the guiding principle of human conduct? What meaning can add to the understanding of human thriving? What are the differences in the ways people make sense of their lives? The recent findings and current problems of meaning as a dimension of positive functioning will be discussed. Dmitry Leontiev and Evgeny Osin are on the faculty of the elite NRU Higher School of Economics in Moscow, where their prolific team does research in the International Laboratory of Positive Psychology of Personality and Motivation. ** Note: This session immediately follows the gala reception with Dr. Jerome Bruner at 6:30 pm. It is hosted by Fordham-LC Psi Chi and Fordham Institute, in cooperation with the Manhattan Psychological Association, PCUN, IAAP, and APA Divisions of International Psychology and Social Issues (SPSSI-NY). For details: takoosh@aol.com. Richard Wexler considered himself to be a healer, lover, and warrior. He fought for what he believed in. He deeply believed in the power of love and gave generously of his time to assist others. He heroically battled cancer until succumbing in December 2014 but not before touching many lives through his bravery and compassion. Richard was the Founder and President of Personnel Systems, Inc. and Past President of the New York State Psychological Association. He was an entrepreneurial licensed psychologist, certified personnel consultant, executive coach, trainer, dynamic speaker, leader in Industrial, Organizational and Personnel Psychology, author, and educator who was committed to creating new opportunities for 21st century psychologists. He was active in many professional organizations. Honors included the Presidential Award in 2005 and Distinguished Service Award in 2006 from the NYS Psychological Association. Once again on April 26, this year’s 43rd Hunter College Psychology conference is free, and all are welcome. Three MPA afternoon panels below, 12:30-3:50 pm. Guests are welcome. Three diverse presentations on cross-cultural psychology teaching, research, and service. In this one-hour session, 3 speakers describe diverse aspects of psychology in New York City, and how the Manhattan Psychological Association is “all things psychological” in New York City. In this one-hour session, 3 speakers describe diverse aspects of psychology programs in New York City, and how the Manhattan Psychological Association is “all things psychological” in New York City. Marymount Manhattan College Psychology Club and SPSSI book presentation on Dec. 2nd. MPA’s Fall 2013 program “Dealing with Uncertainty in an Uncertain World,” will be held on Sunday, December 8th from 1 to 4 pm at the New Building of John Jay College on 59th Street at 11th Avenue. The speakers include renowned, board certified, CBT psychologist, Simon Rego, PsyD, ABPP, ACT, who will be discussing practical ways for dealing with anxiety both in and out of therapy sessions. In this climate of economic uncertainty, we are also pleased to have on the program Joseph Sciabica, AEP, ChFC, CFP, Senior Vice President of the Wealth Advisory Group and expert in career development and financial planning.